This new collaboration from Soho Theatre and Newcastle’s Live Theatre brings together scenes on the subject of utopia, penned by a motley crew of playwrights, such as Simon Stephens and Janice Okoh, and contributors from other fields, from comedian Dylan Moran and Labour MP Chi Onwurah to, um, Hitler. Directed by Steve Marmion and Max Roberts, these ‘visions of a perfect world’ are cobbled together into a whole, performed by six actors as ‘wise fools’ in clown makeup, who examine and eventually discard the blueprint of each flawed utopian ideal, while chucking in a bit of faux-reluctant singing and lacklustre dancing. The piece is supposed to question what utopia is and what brings out the best in people – whether it’s being kidnapped by aliens, an 80-year-old woman having a breakdown in a Zumba class or simply the sensory joy of biting into a fat, ripe, juicy peach. The idea is a good one: a series of inspiring and heartwarming visions, a shot of kindness and humanity – an antidote to the decidedly dreary world we’re living in. And with topical lyrics by Marmion – set to jaunty music by Arthur Darvill – about the Leveson enquiry, big society and Northern Rock, it’s clear the play is designed as a reaction against our own bleak time of austerity. But, although individually, the scenes are often funny and touching, the piece appears hastily constructed and lacks cohesion. It has its bright moments – like Alistair McDowall’s witty reimagining of the Kony 2012 phenomenon – but, overall, it could do with being shorter, certainly snappier, as the sketches tend to drag on and, as they’re cut into short scenes and interspersed with others, it becomes a rather repetitive ordeal. 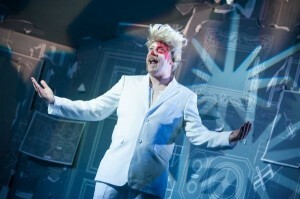 Utopia runs until 14 July at Soho Theatre, 21 Dean Street, London W1D 3NE. Tickets £12.50-£20.